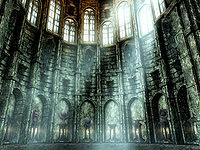 The Temple of the Divines is the main temple of Solitude and Skyrim, housing shrines to the Eight Divines. It is located on the eastern side of the Castle Dour's courtyard. Northwest of the Blue Palace. In front of the entrance is a private courtyard with two arches providing entry from Castle Dour's courtyard. One to the south and one to the west. 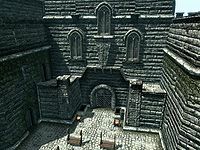 This second gated arch is blocked by the gate being lowered after starting the Dark Brotherhood quest Bound Until Death Where you interrupt the wedding of Vittoria Vici. In addition to a couple of rows of wooden benches facing two thrones, once the quest is started there are tundra cotton plants in pot either side of the thrones, other pots planted with snowberry bushes and lavender plants, and wooden tables against the side walls of the courtyard holding platters and bowls of various foods, including salmon steaks, tomatoes, red apples, boiled creme treats, sweet rolls, honey nut treats, etc. and bottles of alto wine and wine. These all remain for the remainder of the game. The entrance to the temple is never locked. Everything inside the temple is marked as owned and taking anything will be considered stealing. Entering brings you directly into the main chamber with the eight shrines at the far end in individual alcoves with an empty alcove where the shrine of Talos stood. There are rows of wooden benches facing the shrines for visitors to sit in worship. At the rear of the chamber is a narrow table on your left with a sprig of snowberries on top and to your right is a small wardrobe containing fine clothes with a potion of health on top. Beside this is a chair and low table with a common book on top and In the southern corner is another narrow wooden table with a chaurus egg, a hagraven claw and a stone bowl containing a bunch of lavender, a sprig of snowberries, a bulb of garlic and a purple and blue mountain flower. A vase to the left holds another bunch of lavender. Freir spends much of her time standing at the rear of the room welcoming any and all worshippers. There are stairs up to the northwest and southeast. Beyond a large pillar is a juniper tree and as you move forward several pots contain snowberry bushes or deathbell flowers. Part way along the southeast wall is an open crate on the floor containing a complete set of The Song of Pelinal, with an extra copy of v3. Near the front is an area to the northwest with a small wardrobe, another snowberry bush in a pot, and a narrow wooden table with a stone bowl on top containing a potion of extra magicka and a potion of health. There are stairs leading down to the southwest, in the corner. To the southeast is a short corridor leading to another small wardrobe and snowberry bush. Climbing the stairs to the northwest, there is a small vase holding a bunch of tundra cotton and to the right stacks of eleven common books part way up the stairs against the wall. At the top of the stairs, on your right is a small unit holding a deathbell flower, a bunch of lavender and a copy of the Argonian Account, Book 2. further along on the right is a small area with a chair, low table and narrow wooden table with an opening to look down upon the main chamber below. The low table has a plate of bread and cheese on top, while the narrow table has two baked potatoes, a sweet roll, a cheese wheel and two red apples on top. Further to the northeast are the sleeping quarters containing three single owned beds; one in the southern corner, one coming out from the middle of the northeast wall and one coming out from the middle of the northwest wall. In the eastern corner there is a large round table and two chairs with a plate of bread and cheese and a potion of regeneration on top the table. Beside this is an opening, through which you can see a potion of regeneration on a ledge half way up the wall opposite. The use of the Telekinesis spell makes retrieving it simple. To the left of the table is a narrow table and wash basin. To the right of the second bed is an end table with a potion of health and a draught of strength on top. In the northern corner is another wash basin, with small wardrobes either side, along the northeast and northwest walls, both have a common book on top, but the one against the northeast wall also has a small coin purse on top. There is a basket by the wash basin containing another small coin purse. To the left of the third bed is an end table and to the southwest is a small area containing two tall wardrobes and a dresser containing fine clothes and an unlocked chest containing minor loot. Climbing the stairs to the southeast are the living quarters. At the top of the stairs there is an end table to the left and a small cupboard to the right with a potion of regeneration on top. Against the southeast wall is a cooking pot on a stand with wooden benches either side. On the left is a small cupboard and bookcase holding a bottle of alto wine, a potion of health, five common books and a flute and with a drum on top. Beside this is a long wooden table coming out from the northwest wall with a bench and chair on either side. On the table is a seared slaughterfish steak, a baked potato, a salmon steak, a loaf of bread, several pieces of cheese, a bottles of alto wine, a bunch of tundra cotton, and a potion of regeneration. To the right are more openings to see down to the chamber below. In the northern corner is a large round table and chair with two salmon steaks, a loaf of bread, a pieces of cheese and a bottle of alto wine on the table top. A small cupboard is beside this. Another small cupboard is further along the wall to the right with a vase holding a bunch of tundra cotton on top. To the right of this is a narrow wooden table with a stone bowl containing a bunch of lavender and a potion of regeneration on top. To the southeast is a door that leads out onto the wall surrounding the courtyard. At the bottom of the stairs descending to the southwest is a room with a gate opposite that requires a key to open. To the left of this is a long wooden table and bench. On the table is a salmon steak, a slaughterfish steak, a cabbage, two potatoes, a loaf of bread and an empty wine bottle. Above the table are two wall shelves with a potion of health and a potion of regeneration, two goat cheese wheels, a loaf of bread and five more empty wine bottles. In the eastern corner are a stack of five food barrels and a door that opens into another bedroom containing a single owned bed in the eastern corner with an end table holding a common book and an empty wine bottle beside it. Above the head of the bed are a pair of wall shelves holding a set of clothes and several hats. At the foot of the bed is a firebrand wine case and a pair of boots. In the southern corner is a square table with a common book and three empty wine bottles on top and a tall wardrobe containing clothes. In the northern corner is another tall wardrobe with more empty wine bottles on top. There are several food sacks near the door. The key to open the locked gate is given to you by Styrr, the priest of Arkay, who looks after the Hall of the Dead in Solitude. The key is given near the beginning of The Wolf Queen Awakened quest initiated by Falk Firebeard. Beyond the gate is a storage area with a food barrel immediately on your right with a potion of minor magicka on top. In front is a set of shelves holding an iron dagger, a sliced eidar cheese and a eidar cheese wheel and beside this is a cupboard holding only clutter. On the left is another set of shelves and a cupboard both of which hold nothing much of interest. There is a round wooden table and two chairs in the middle of the room, a dresser to the southeast with an iron dagger on top. In an alcove to the southwest is a large vat. In the corner is a fenced area holding many Honningbrew mead barrels. Opposite this is another set of shelves filled with empty wine bottles. To the southeast is a corridor with a hole in the wall at the far end leading into Potema's Catacombs. On the right is a stack of crates with a potion of minor healing on top. The shrine to the Ninth Divine, Talos, is not present due to the ban on Talos worship as demanded by the White-Gold Concordat. There is an empty alcove where his shrine sat before being removed. However, a shrine to him will later appear within if you join the Stormcloaks and capture Solitude. This page was last modified on 17 February 2018, at 17:29.